Wow Linda what a cool use of the stamps. Beautiful page. Your layout is really beautiful. I love how you put the phoitos on the page. Just loving those banners you have made with the border stamps. I love that you didn't make this a Christmas theme! FABULOUS!! Love ya! The grid idea is brilliant! Love the stitching & your use of the stamps. Great page with gorgeous photos! Awesome, clean page! 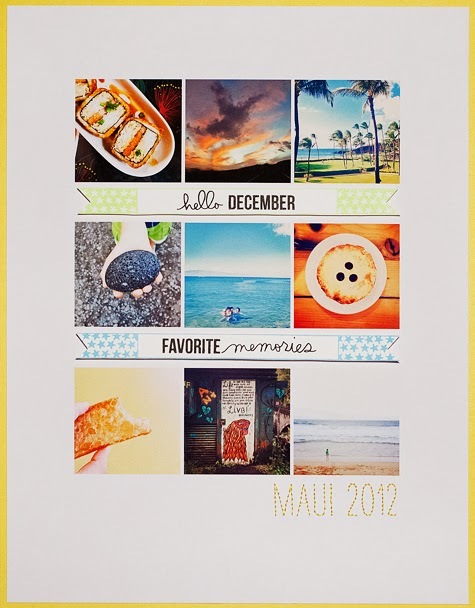 Love how you used these basically Christmas stamps in another way, and they fit your Hawaiian page beautifully! Thanks for the inspiration! Great layout! Love how you used the stamps! Great layout. Love the banners and the stitching. Great stamp set this month. Love how you notched the ends of the stamped strips! Your use of the stamps gives an entirely different look than Ali's. Love it. Love the white space. And I took note of your technique for doing embroidery...I have been drawing on the paper then following the line but I like this idea of doing it on another paper just to get the placement for holes without the messy line showing beneath the stitching. Thank you! Love it! Especially love the stitching! The grid design is perfect here. I love how you made the rectangle stamp into banners and used these stamps on a non-holiday page! Thanks for sharing it! Beautiful layout! Thanks for taking us through the process as well - love hearing about it! beautiful page, great use of the stamps! What a fun layout. The vacation looks memorable, awesome job! oh...this speaks to my grid lovin' heart:) wonderful use of the stamps and i totally love your stitched title. definitely a fave layout that I have seen in a long time. Love the grid layout. Thanks for sharing new ideas. Love your CAS layouts! This is clean and bright and airy and I love the stitching title! This layout appeals to me so much because I also love to use grids on my layouts. It keeps them simple and clean. Love this layout ... thanks for showing us other uses for the stamps. I saw it & just kept thinking Christmas. It is perfect here ... love the grid layout! 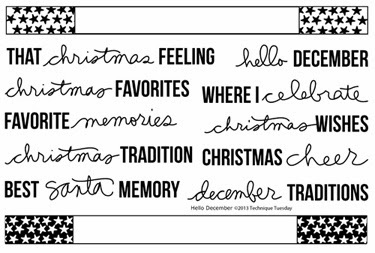 Great grid design, and I totally love how you've used this "holiday" stamp set in non-holiday fashion! Love the layout, wish I was there! Nice layout. the and use of the stamps. The yellow border and the hand stitching make the page outstanding. It's very clean. Wow! This layout is so versatile! Love these stamps, very useful! 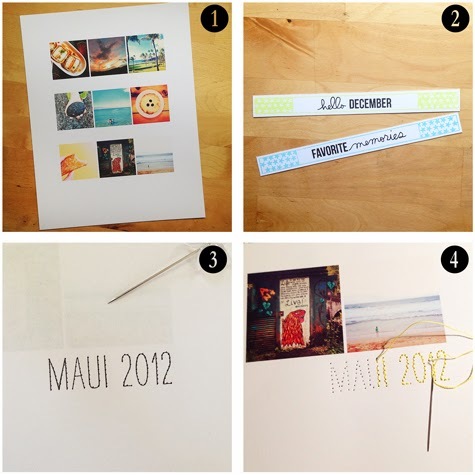 Thanks for showing how versatile Ali's stamp is this month, another reason I really want it! 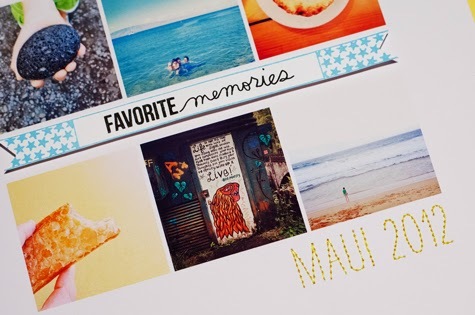 Your trip to Maui looks like it was fantastic, it's definitely on my bucket list to go some day! I love that you used this on a layout that isn't Christmas themed. I am always trying to get more usage out of the stamps I own. I love the simplicity of this page that allows the photos to really shine! A good idea to use the grid system. I try to step my cards and it often doesn't work - there's not enough room for many cards. I get tired of trying to adjust them and finally just give up. thanks for the tip. I'll be trying it out. Fabulous design, I love how you used the stamps! Using the grid is such a clever and efficient way to do a layout. Fabulous layout. Love the clean lines and the perfect mixe of photographs, colours, stamps and white space! thought I didn't need these stamps till I saw your page...oops, wrong! What a fun and surprising LO - sunset on the beach in December! I like this grid, Linda, and all the detail! What a great LO - love the clean lines! the stamps were perfect for this layout. Love the fresh clean lines. Love the clean look of your layout as well as the way you used the stamps. Wonderful page! I love how simple it is but stands out on it's own. Hey...who wouldn't be ready for a trip to Hawaii when it is all cold and snowy at home?!! Love your stitching! Great page! Delightful colors and love the stamps!!! I love that you made banner flags with the stamps. And I love that stitching!! great capture of fun memories.